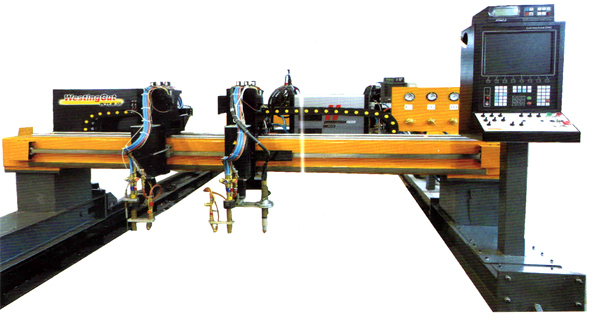 The ArtCut CNC flame/plasma cutting machine is a flexible all-round system that is very cost effective, and by combining oxy-fuel cutting and plasma cutting processes this system provides users with productivity improvements and cost saving benefits. This single machine is suitable for gas cutting of carbon steel in 5-300mm thickness range, and can support plasma cutting for stainless steel, carbon steel and non-ferrous metal in 0.5-160mm thickness range (de sending on capacity of plasma source selected). The rack & pinion drive mechanism employs a reliable brushless AC servo system with precision planetary gearboxes for high positional accuracy, and linear guides for smooth, accurate motion of the torches in the cross axis. Heavy duty rail is machined and surface treated for long life and smooth motion. Each oxy-fuel torch is mounted to a robust motorized lifter, using a ballscrew mechanism and linear guides to insure the up/down movement is accurate and true. 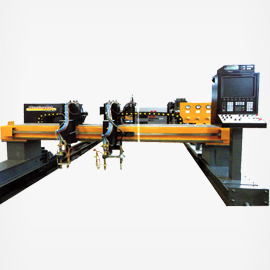 Automatic flame ignition and automatic capacitive torch height control systems offered to fully automate the cutting process and insure the cut quality is consistently high. Plasma torch positioners all have built in 360 ° anti-collision devices to protect the torch from damage. Several options for arc voltage torch height control are offered so the most suitable system can be selected to match the type of plasma cutting system required for the user application. The Art CUT is offered with a choice of user friendly CNO controls, and by using our nesting software to prepare cutting programs the user can optimize plate utilization and consistently produce high quality cut parts!